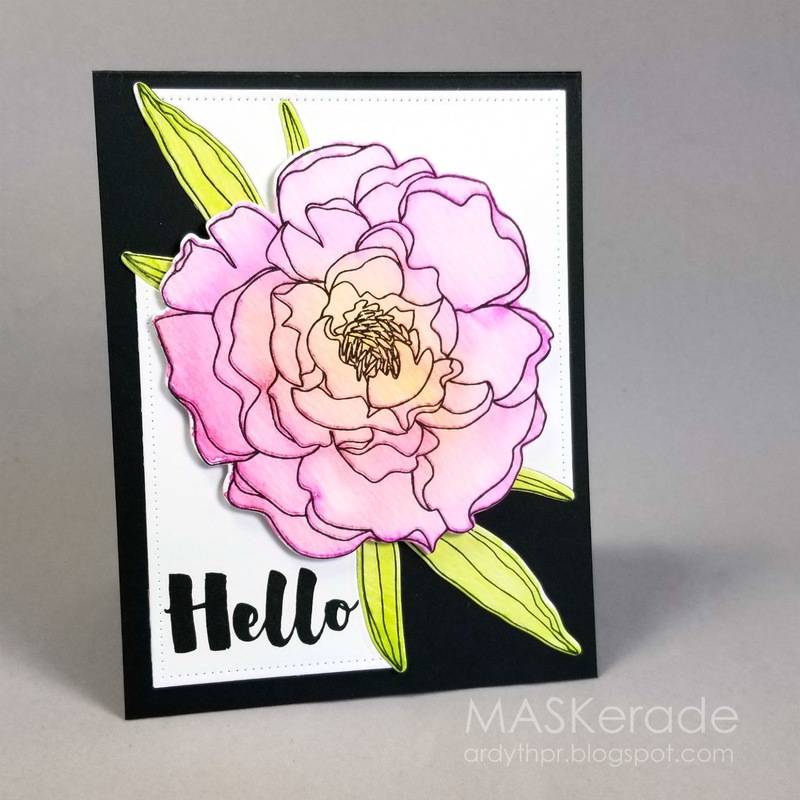 MASKerade: FS573 - Hello, Happy Birthday! FS573 - Hello, Happy Birthday! Congratulations to this week's Splitcoaststampers' Featured Stamper Karen (KareBear51)! I cut out the new Stitched Plaid Cover Plate from A Jillian Vance Design with Catherine Pooler Smoke cardstock and then a partial one from MFT Stamps Sparkline Silver cardstock so that I could inlay some sparkly squares. I randomly re-filled the holes with smoke and sparkly squares for interest and texture. I heat embossed a sentiment and popped it up using foam tape. Tomorrow is my hubby's birthday, so this is perfect for him! I thought about those kids' painting books where you just use a wet brush and I wondered about watercolouring using a stamped outline. I started with Ranger watercolor paper and knew that I needed to use inks that will react with water. I chose a couple of my favourite Catherine Pooler inks and inked up my stamp. Then I spritzed it with a fine mist of water to activate the colour and moved the colour around with a brush. . I was hoping it would look stunningly beautiful at that point, (like a new method for no-line watercolouring) but it had lost a lot of definition, so I just restamped with a black outline. I used Versafine because it's water proof. I love both of these cards. The watercolor technique is great. I can’t wait to give it a try. 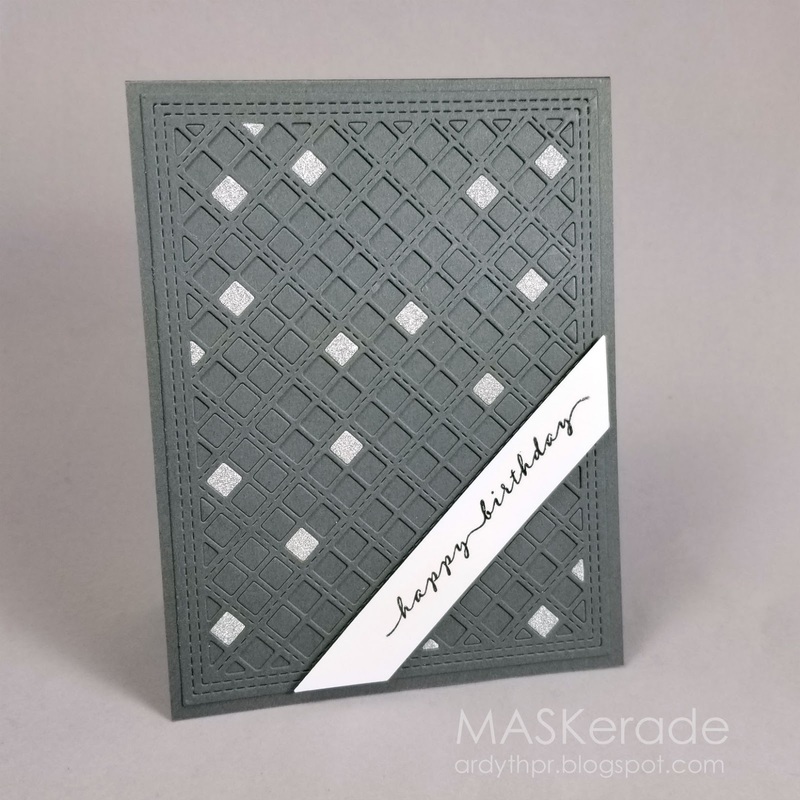 And, I’m so in love with the plaid cover plate die. This card has so much texture and style. It’s hard to design men’s cards but boy you hit it right on. Thanks for sharing. Your birthday card for your hubby is absolutely wonderful! beautiful cards, what a great idea with the watercolor. I loved those painting/coloring books as a girl!